A custom-made AFO (Foot/Ankle Orthotic) is necessary for those with an inward collapsing or collapsed foot, which is often very painful & makes walking difficult. This may be the result of compensating for a shorter leg (congenitally shorter or caused by prior surgery-esp. from hip or knee replacement), fracture or other injury, or from a very weak foot structure. In the past, we tried many different types of AFOs for our patients as most were difficult to get used to wearing, painful to wear, didn’t hold the foot and ankle properly and/or were difficult to fit into shoes. In our quest to find the best AFO available, we found a small lab in Maine that makes “the perfect custom AFO” that is not only comfortable and easy to wear but can get you walking straighter & better... without pain! The Westwood Foot Clinic in Golden Valley is the only clinic in Minnesota that uses this particular brace... which is also covered by Medicare and most other insurance plans. 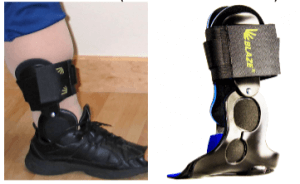 A drop foot brace is necessary for those who have weakness of the muscles that lift up their foot and toes when walking, causing the front of the foot will drag or catch when walking. Drop-foot is often caused by a stroke, injury or neuromuscular disease. This can make walking difficult & make one much more prone to falling. The same lab in Maine that makes the custom AFOs mentioned above also makes a special custom-made, low profile and light weight Drop Foot Brace. 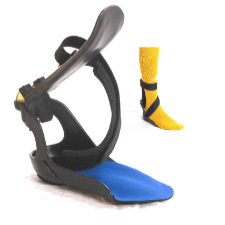 This brace pulls the foot up when walking for a more normal gait pattern with less chance of falling... and it is easy to wear. Like the AFO that we use at the Westwood Foot Clinic in Golden Valley, we are the only clinic in Minnesota that uses this particular lab and their special custom-made drop foot brace... which is also covered by Medicare and most other insurance plans.